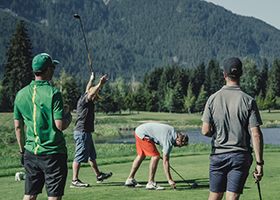 The Nicklaus North Junior Membership is designed to give new and experienced juniors, ages 10-18, an opportunity to experience the “Game of a Lifetime”. We will do this by ensuring that all juniors have fun, learn the respect, history and traditions of the game, as well as, develop the skills of our future Members and Champions. Golf Instruction - Each Junior Passholder, has the opportunity to receive 3 half hour golf lessons with one of our Canadian PGA Golf Professionals for $60. The lessons are booked individually with the Instructor of choice and are valid until September 1st. It is recommended the Junior remain with the same instructor throughout the season for continuity. Private Golf Lessons - Additional private instruction is available to Junior for only $40 per 45 minute lesson! Private Lessons are a great way to get extra instruction throughout the season in a more “learning friendly” environment. If interested in additional group lessons, Juniors may be added at a cost of $10 per additional Junior, up to a maximum of 4 Juniors per lesson. Playing Privileges - Juniors are eligible to book a tee time on the day of play Monday to Thursday (excluding holidays) and have ‘Stand By’ playing privileges Friday, Saturday and Sunday where the Golf Shop will do whatever possible to get them on the course. Juniors must check into the Golf Shop upon arrival and the Golf Shop will advise of the next available time. All play starts from the first tee. Guests - A green fee for your Junior Guest (18 and under) must be purchased in the Golf Shop at a rate of $50 during peak times and $35 during twilite hours. Adult Guests of Junior Passholders pay the applicable GolfBC Cardholder rate. Juniors can bring a maximum of 3 Guests at one time. Etiquette & Pace of Play - The golf course is a quiet place - no shouting, screaming and absolutely no profanity. Respect all fellow players by remaining quiet and still when they are playing. Carefully watch the results of shots. Ensure the golf course looks better after you have played it. Repair ball marks (yours and others), rake sand traps, and replace divots (yours and others). The Players Assistant’s are empowered to ensure all groups “keep the pace” which may result in the necessary changing of tee boxes or removal from the course for failure to keep up with the group in front or failure to follow proper etiquette. Any inappropriate conduct will be reviewed by the General Manager and Director of Golf and may lead to immediate revocation of privileges. Power Carts - Juniors are not permitted to operate power carts. Personal Property - A club storage and locker rental package is available for $150 and may be purchased in the Golf Shop in May. All property left in lockers, clubhouse bag storage, or in automobiles in the parking lot is done so at the Junior’s own risk and neither Nicklaus North Golf Course nor it’s insurer are responsible at any time. Practice Facility - Juniors must check into the Golf Shop before heading to the Practice Facility. The Professionals in the Golf Shop will always have final say on when the Practice Facility is available. Dress Code - The Nicklaus North Golf Course Dress Code is in effect for all Juniors, while on the golf course or at the Practice Facility, and must be taken very seriously. Golf at Nicklaus North Golf Course is a respected privilege. To maintain that standard Juniors must be dressed appropriately and in good taste at all times. The General Manager, Director of Golf and their staff are empowered to administer this dress code and to refuse the use of the Clubhouse and the Golf Course facilities. The dress codes are those recommended by the various Golf associations, which require players to dress neatly and appropriately. Males - Tailored pants or shorts, and a Collared shirt tucked in.